Ashta Choornam is an ayurvedic classical medicine beneficial for the abdomen. It pacifies Vata, decreases Kapha, and increases Pitta. It also increases gastric juices and stimulates bile secretion. Thus, it is helpful in the treatment of loss of appetite. It has carminative action and prevents gas formation in the abdomen. Therefore, it is beneficial in intestinal gas, bloating and flatulence. It has antispasmodic action, so it is useful in cases of abdominal colic. Furthermore, it is used to treat abdominal lumps, incomplete evacuation, Vata Disorders, Kapha Disorders, and irritable bowel syndrome (IBS). In addition, it is also useful in diseases occurring due to Ama accumulation in the body that also include rheumatoid arthritis. However, it acts as supportive medicine in such cases. Ashta Choornam mainly acts as a digestive stimulant, appetizer, and carminative. Therefore, it is mainly used for the disorders related to digestive system. Ashta Choornam has following healing properties. Ashta Choornam mainly used to increase the Pitta in the digestive system. It is mostly used in cases of loss of appetite occurring due to a decrease in the secretion of gastric juices. However, aggravated or increased Pitta may result in loss of appetite, so it should not be used in such case. Otherwise, it may cause burning sensation, sour belching, restlessness, vertigo and worsen the existing symptoms of excess Pitta. Ashta Choornam is helpful in following health conditions. In these conditions, it can be used as supportive therapy in addition to main treatment of these diseases. All ingredients in Ashta Choornam have an appetizer and digestive characteristics. These ingredients increase the secretion of gastric juices in the stomach and bile secretion from the liver and gallbladder into the intestine. Ultimately, it stimulates the sense of being hungry and improves digestion. Therefore, Ashta Choornam is useful in the treatment of loss of appetite and poor digestion. Ashta Choornam should be used in people who lost their desire to eat due to an organic cause. It can include a decrease in the secretion of gastric juice or bile salts and liver disorders. It is also beneficial in loss of appetite occurring after fever, hepatitis, chronic liver disease, and hypothyroidism. In Anorexia, the patient has no desire to eat, but he is hungry. He restricts eating food because of the anxiety of gaining weight. In such case, it may not work well when used alone. In such case, it should be used along with Drakshasava, Rajat Bhasma (Chandi Bhasma), and Abhrak Bhasma. It will only be beneficial when the patient has Vata or Kapha condition. In case of Pitta condition, it should not be given. In such case, Kamdudha Ras, Praval Pishti, Mukta Pishti, Drakshasava, Rajat Bhasma (Chandi Bhasma), and Abhrak Bhasma are more beneficial. These ayurvedic medicines should be given in combination. Asafetida or Hingu is a principal ingredient that tames intestinal gas and relieves flatulence due to its strong carminative potential. Other ingredients including celery seeds, white cumin, and black cumin also assist to prevent gas formation. According to Ayurveda, Vata Dosha and poor digestion are mainly two factors responsible for causing excess gas. All herbs in Ashta Choornam acts upon Vata Dosha and improves digestion. Thus, it relieves intestinal gas, flatulence, and abdominal distension. In some case, gas only causes belching, abdominal discomfort, flatulence, and abdominal distension. Some patients also feel the presence of a lump in the abdomen. In most cases, it is due to accumulation of gas in the abdomen. According to Ayurveda, it is an obstruction in the passage of Apana Vayu. Ashta Choornam clears the passage of Apana Vayu and releases the gas, which eases the symptoms of Abdominal Lump. However, if the abdominal lump is due to any cause other such as tumor than gas, then it will not work. If the underlying cause of abdominal pain is excessive gas, then Ashta Choornam is a drug of choice. In such case, it should be given with Cow’s Ghee. Incomplete evacuation generally occurs due to poor digestion of food, especially fats. The second common reason behind it is intestinal motility dysfunction, which delays propelling food content along the gastrointestinal tract. In both cases, Ashta Choornam is helpful. It improves fat digestion, reduces the stickiness of stool, and reduces mucus content in the stool. Furthermore, it stimulates the secretion of bile into the intestine, which induces proper peristaltic movement and propels the intestinal content. So, it ultimately relieves incomplete bowel movement. Ingredients in Ashta Choornam have strong antihyperlipidemic potential. Moreover, it also has anti-inflammatory, hepatoprotective and antioxidant effects. The accumulation of triglycerides and other lipids in the liver cells and low-grade inflammation are the most common causes of fatty liver disease. According to Ayurveda, it only occurs when a patient has poor PACHAKA PITTA, which is unable to digest lipids and other food particles properly and results in accumulation of AMA in the body. It also relates to fat accumulation in the liver cells. 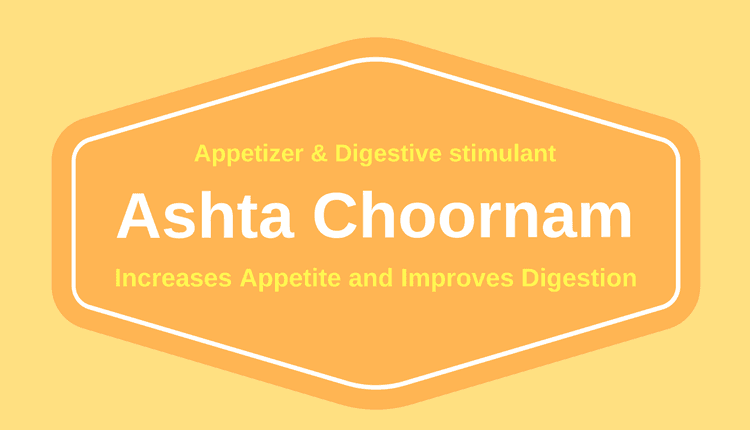 Ashta Choornam stimulates liver function, digestion, and metabolism. It further reduces inflammation and fat accumulation in the body. Thus, it also helps to treat fatty liver disease (hepatic steatosis). When should I take? In cases of anorexia or loss of appetite, Ashta Churnam should be taken before a meal. It should be taken after a meal in cases of poor digestion, abdominal heaviness, and intestinal gas. Ashta Choornam is likely safe for the most individuals with Vata or Kapha disorders and decreased Pitta symptoms. It might not be safe for people with disorders with Pitta aggravation. However, these side effects are rare and only occur when its dosage exceeds from 6 grams a day, especially seen in patients with Pitta Body Type. Ashta Choornam should not be used during pregnancy because it contains Asafetida (Hing), which can increase uterine contractions and may lead to miscarriage. Lactating mothers should avoid it in excess dosage (more than 2 grams per day) due to its hot potency. Can we use Ashta Choornam for weight loss? The ingredients in Ashta Churna have anti-obesity actions, so it can also be used for weight loss. It helps to improve metabolism and aids in fat reduction. However, it also has appetizer property, which helps to improve appetite. Therefore, some people initially may experience increase in their appetite. But after a few days, appetite will become normal and it start helping in fat reduction. Is it beneficial for gas, flatulence or colic in babies? How can we use it for this purpose? Yes, it can help to reduce gas, flatulence and abdominal colic in infants or babies. Mix 50 mg Ashta Churna in a few drops Cow’s Ghee. Give this mixture to a baby once or twice a day.